The Associated Sulpicians of the United States Archives is the repository for the U.S. Province of the Society of the Priests of St. Sulpice. The Sulpicians are a community of diocesan priests who “devote themselves to the discernment of vocations, to the initial and ongoing formation of priests as well as to the exercise of other ministries.” (Art. 1, Constitutions of the Society) They are a Society of Apostolic Life of pontifical right. The Society was founded in 1641 by Rev. Jean-Jacques Olier (1608-1657) and derives its name from the parish of Saint-Sulpice, Paris, where Rev. Olier was curé. Here he established a seminary based upon a spiritual renewal of the diocesan priesthood as envisioned by the Council of Trent (1545-1563). Others who shared his commitment to reform led to the Society’s staffing of diocesan seminaries across France. In 1657, the Sulpicians established a North American presence when four members were sent to serve as missionaries to the colonists and native peoples of New France (now Canada). The proposal to establish a foundation in the United States was made in 1790 by the Superior General of the Sulpicians, Rev. Jacques-André Emery, P.S.S. (1732-1811) to Bishop John Carroll of Baltimore. In the spring of 1791, four Sulpicians departed for the United States where they established the country’s first Roman Catholic seminary at Baltimore. Since their arrival, the community has founded, staffed, or served on the faculty of 17 major and minor seminaries. 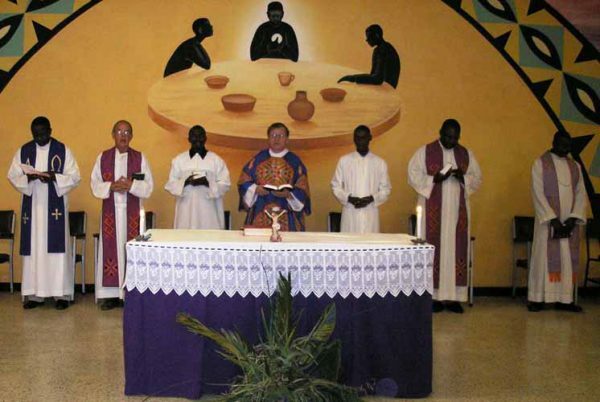 In 1989 the U.S. Sulpicians sent their first members to Zambia, Africa, where today they staff and serve on the faculties of four seminaries. The records in the archives document the history of the U.S. Sulpician community, as well as their influence on the growth and development of the U.S. Catholic Church. Today, the Sulpicians own and operate St. Mary’s Seminary & University (1791), Baltimore, MD, and staff Theological College of The Catholic University of America (1917), Washington, D.C., Emmaus Spirituality Centre, Lusaka, Zambia, and St. Augustine’s Major Seminary, Mpima, Zambia. The U.S. Sulpician community was included in the French Province until 1903, when the U.S. Province was created. Today, the Society is comprised of three provinces: France, Canada, and the United States. For more information on the history of the U.S. Province, see Christopher Kauffman’s Tradition and Transformation in Catholic Culture: the Priests of Saint Sulpice in the United States from 1791 to the Present (New York: Macmillan, 1988) or visit the website of the Province. Individuals interested in the records of the French and Canadian Provinces will need to contact them directly. Researchers are able to access open collections through the existing card catalog system and are arranged according to the record series listed below. Please see the Collection Access Policy for information on the procedures regarding access to and use of the records. The artifacts collection is limited to a small number of commemorative items, sacred objects, including relics, class banners from St. Charles College, and portrait paintings of prominent Sulpicians and other individuals connected to the Society. Size: 7 records storage boxes; date span: c. 1935-present. The audio/visual collection is made up of audio recordings, 8mm and 16mm films (transferred to video), and videos taken of Sulpician institutions and events, including early footage of the campuses of St. Edward’s Minor Seminary and St. Thomas’ Major Seminary, Kenmore, WA, St. Charles College, Catonsville, MD, and St. Mary’s Seminary & University, Baltimore, MD. Size: 10 records storage boxes; date span: 1811-1991. This series is made up of both primary and secondary records relating to special projects and programs sponsored by the U.S. Province, including preparations for the tercentenary anniversary of the founding of the Society of St. Sulpice in 1941 and the bicentennial celebration of the Sulpicians’ arrival in the U.S. in 1991. There is original correspondence, copies of original correspondence found in other archives, and commemorative publications. Size: 44 records storage boxes and 12 document cases; date span: c.1762- present. This series is made up of primary and secondary records that document the history of the U.S. Catholic Church, highlighting Sulpician connections to prominent events, people, and places, including the seven provincial and three plenary councils held in Baltimore, Mother Seton and the Daughters of Charity, Mother Lange and the Oblate Sisters of Providence, and photocopies of records in the Sulpician Archives in Paris, France. This collection has the papers of both Sulpician and non-Sulpician individuals, including the noted biblical scholars Rev. Joseph Bruneau, P.S.S., and Rev. John B. Hogan, P.S.S., and the highly esteemed Confederate poet, Rev. John Banister Tabb (1845-1909), a priest of the Diocese of Richmond who was on the faculty of the Sulpician minor seminary, St. Charles College (1848-1969). Photographs have been included when available. Click here for more information. The U.S. Province of the Society of St. Sulpice has founded and/or staffed thirteen major and minor seminaries in this country. The collections for these institutions vary from place to place, with those for Maryland being the most extensive. Documentation consists of such records as student rosters, house diaries, history files, yearbooks and other student publications, as well as official correspondence and documents. Records for other Sulpician institutions and programs, including the U.S. Solitude, can be found in this series. Collections are listed alphabetically by state, then city/town. Click here for more information. This series is made up principally of Sulpician individuals and institutions. There is also a significant collection of non-Sulpician individuals, including alumni and members of the U.S. hierarchy. The series is divided into three subgroups: individuals, institutions, and shutterbugs. All are arranged alphabetically. The prints in this series are mostly black and white and vary from wallet-sized images to 11″ x 14″ and larger. In addition to photographs, there are also slides, negatives, scrapbooks, and albums. The holy card collection is also housed with photographs. Size: 6 records storage boxes and oversize; date span: c. 1800-present. This collection contains photographs and prints of Sulpicians and non-Sulpician individuals. Size: 4 records storage boxes, 8 document cases, and oversize; date span: c. 1890-present. St. Charles College and High School Collection [Ellicott City and Catonsville campuses]. Size: 2 records storage boxes, 1 document cases, and oversize, date span: c. 1890-1969. Includes class photographs, and portraits of prominent individuals. St. Mary’s Seminary & University Collection – See Collection Description for St. Mary’s Seminary & University. St. Mary’s Seminary College Collection – See Collection Description for St. Mary’s Seminary & University. Other Sulpician Foundations Collection- Size: 2 records storage boxes and oversize; date span: c. 1920-present. Includes campuses of St. Patrick’s, Menlo Park, and St. Stephen’s, Kaneohe; date span: c. 1920-present. Size: 2 records storage boxes, 11 documents cases, 72 photograph albums, and 25 scrapbooks; date span: c. 1890-1980. This series is comprised of the scrapbooks, photograph albums, and photograph and slide collections that have been donated to the archives over the years by individual Sulpicians and the alumni of Sulpician institutions, including Rev. Vincent Eaton, P.S.S., Rev. Carlton Sage, P.S.S., and Rev. John Bowen, P.S.S. Size: 12 shoeboxes; date span c. 1820-present. This collection contains holy cards that commemorate holidays, jubilees, ordinations, and deaths of Sulpicians, individuals affiliated with the Sulpicians, and prominent individuals. The records of the provincials date from their arrival in 1791 and document the the founding, growth, and mission of the Society of St. Sulpice in the United States. Until the U.S. Province was established in 1903, the Sulpicians who served in this country were members of the French Province. The Sulpician appointed to oversee the spiritual and temporal affairs of the U.S. community during this period held the title of superior. In 1921 the first provincial was appointed to administer the U.S. Province. Researchers are currently able to access the papers of the first superior, Rev. François C. Nagot (d. 1816), through the second provincial, Rev. John F. Fenlon (d. 1943). Click here for more information. This series is made up of a general reference library that includes works on the U.S. Catholic Church and the Society of St. Sulpice, internal publications published by the U.S. Province and its institutions, including the Voice of St. Mary’s Seminary (1924–1970), the Borromean (1915-1969), yearbooks and course catalogs for various Sulpician institutions, directories for the Society’s three provinces, and subscriptions to the following journals: Catholic Historical Review, U.S. Catholic Historian, Maryland Historical Magazine, and the Bulletin de Saint Sulpice. Dissertations, theses, and books written by Sulpicians are also included in this series. Size: 8 records storage boxes; date span: c. 1779-present. This series documents administrative matters of the U.S. Province including activities of the Generalate and the Assembly, and aspects of the Sulpician Provinces in France for the years ca.1779 – 1996, and in Canada ca.1802 – 2001. The records in this series include correspondence, circular letters beginning with 1971, copies of published literature, ecclesiastical writings, student lists, directories, and commemorative publications. We are open to researchers by appointment only. Contact us to make an appointment.